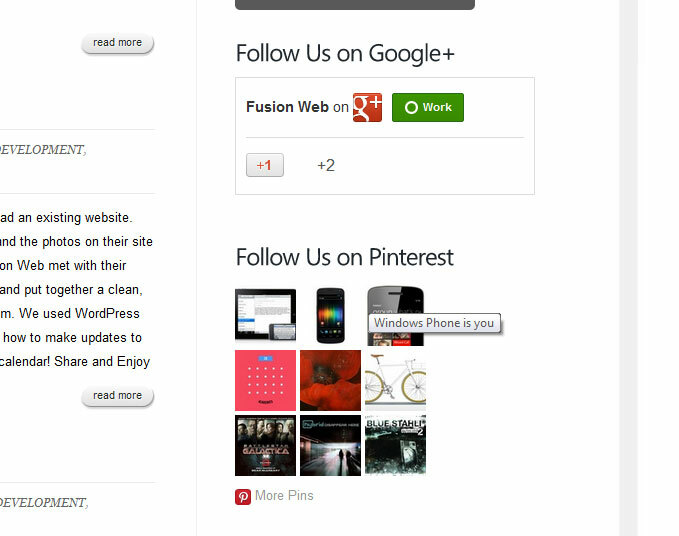 Fusion Web is now on Google+ and Pinterest! You’ll notice that we have added more Social Networking into the Fusion Web site! Over the last 48 hours I set up our Google+ page and our Pinterest profile. I also discovered some new WordPress Plugins that integrate both of these great sites into sidebar widgets. Please feel free to take some time to add us to your G+ circles and take a look at our Pinterest pins. If you would like to use Pinterest, Google+ or any other social network’s tools to boost your company’s visibility, please email us at info@fusionaz.com. Also, don’t forget to read why I recommend Pinterest for businesses: Pinterest: It’s Not Just For Crafty Women.